It has been a very hard year. Very Hard. And it isn’t over yet. But the ending will be better than the beginning. I am sure of that! I am not going to say it couldn’t get any worse because the last time I did, it did! Last September The Man in my Life was diagnoseded with Colon Cancer. Before surgery his CEA was 14. Aftr surgery it was 9. Today it lingers around 2.9/3.0 Normal is anything below 5. What wonderful numbers those have become. I wrote my First LiveSTRONG post last year on this day. Last year seems like a long time ago. If you remember My MIL had been diagnosed with MDS – MyeloDysplastic Syndrome. The Doctor gave her a year. She passed away on September 13, 2011. We had a little over a year with her – as the doctor predicted. It was hard on the family, naturally, but doubly so because of my Husband’s condition. There is no official LiveSTRONG with a Taste for Yellow this year, but I couldn’t let the day go by without some kind of special post. It is hosted every year by Barbara of Winos and Foodies, but this year she has just finished another round of Chemo and just wasn’t up to it. My MIL’s favorite dessert was Lemon Meringe Pie. It is also My Husband’s favorite. We had it for his birthday. He is 61. We are thankful he was here for it because we almost lost him in February. He has many many more ahead of him. 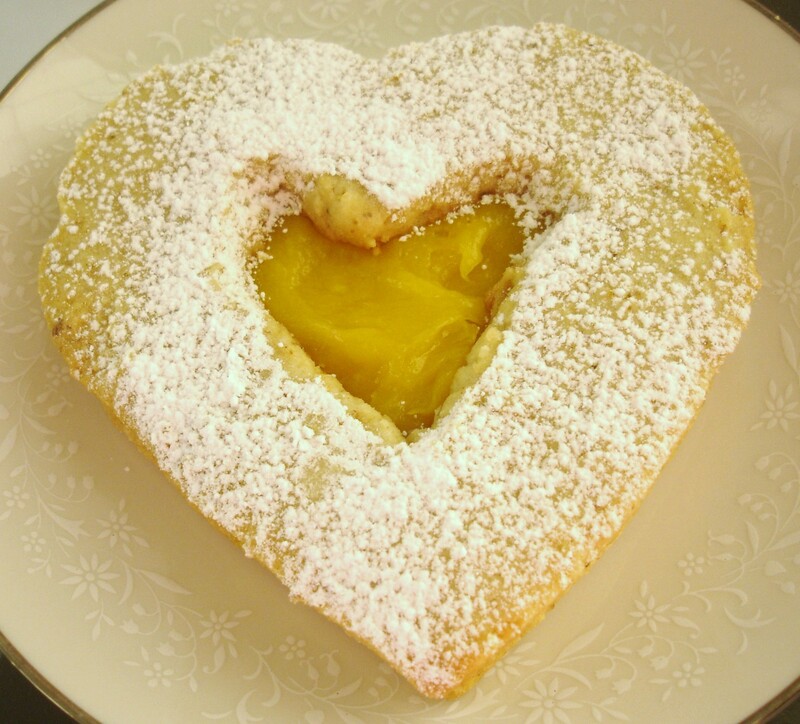 …from Malgieri’s BAKE! for my Husband even tho he cannot eat them because he is in the hospital again. But it’s for a good reason this tme. They will still be here when he gets out. Preheat the oven to 350 degrees with racks in the top and bottom third of the oven . Line a 9 x 13 pan with buttered foil or parchment paper, and line a baking sheet with parchment. Roll out the pastry to a little larger than 9×13, and place it in the prepared 9×12 pan, pressing in into the corners. Remove all but 1/2 inch of the dough on the sides of the pan. You need that much lip to contain the filling, but you don’t need more than that. Chill the crust while you prepare the crumb topping. In a medium bowl, combine the flour, sugar, baking powder, and salt. Stir in the butter. Let it sit for a few minutes, then break up the clumps with your fingers so you have 1/4 to 1/2 inch pieces and sprinkle those on your prepared baking sheet. Place a piece of parchment on top of the pastry in the 9×13 pan (cut or fold it to fit) and weigh it down with pie weights or dry beans. Bake the crust on the lower rack and the crumbs on the upper rack for 10 minutes. Move the crumbs to the lower rack. Remove the weights and parchment from the pastry, and place that pan on the upper rack. Bake the crust until it is dry and golden and bake the crumbs until they are deep golden and firm. Cool the crust and topping on racks. Meanwhile, move the oven rack to the center position. While you’re waiting for the pastry to cool, make the lemon topping. Whisk the eggs and zest in a bowl. In a separate bowl, mix the sugar and lemon juice, stirring to melt the sugar as much as possible. Add the sugar-juice mixture to the eggs, and stir gently to combine. Pour the lemon mixture into the prepared crust, and bake until the topping is set, about 15-20 minutes. Remove the pan from the oven, scatter crumbs on top, and bake another 5 minutes. Cool the pan on a rack for 15 minutes before removing the bars using the foil or parchment as a sling. Transfer the bars to a cutting board and let them cool completely before cutting into squares. Flour your work surface and dump the dough out. 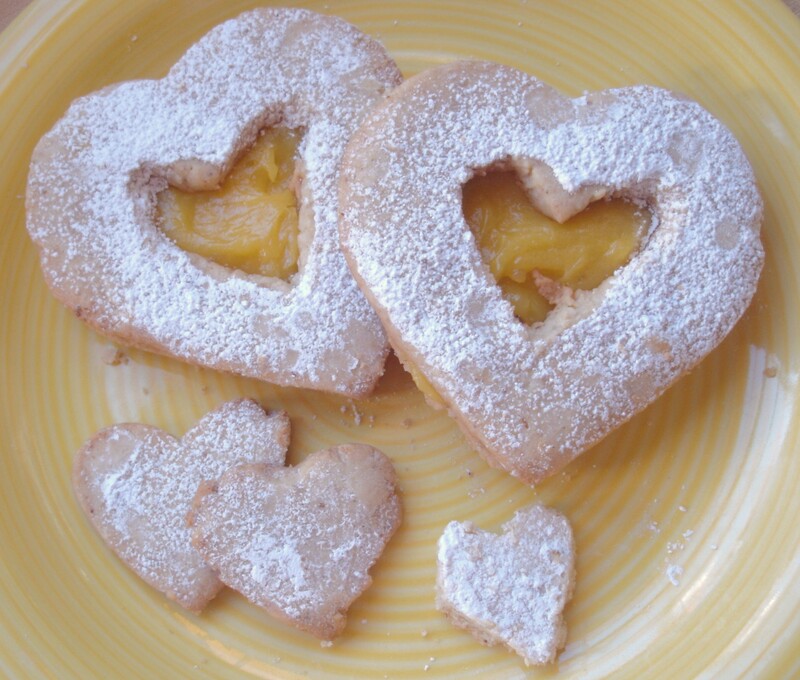 Form it into two disks (if you’re making pies) or into a square if you’ll be making the lemon bars. Wrap the dough in plastic wrap and refrigerate until needed, up to 2 days. I made them more like a tart. At the funeral one of Nana’s friends told me that she thought a lot of me. I never knew that. Now it’s nice to know. She was a nice lady. A good Mom. A Great Grandmother. And I will miss her. These are for Nana and My Man!! And all of those out there who are struggling with Cancer. And their families. Today is October 2, 2010. In case you didn’t know this was the day in 1996 that Lance Armstrong was diagnosed with Cancer. He was 25. Today he is 40. Live Strong!!! Please visit The Lance Armstrong Foundation. You aren’t alone. It always is something that happens in other families. Twenty some years ago my MIL was diagnosed with Breast Cancer. She went through all the chemo and radiation. She has been doing quite well. The radiation has caused MDS – MyeloDysplastic Syndrome – where the body doesn’t make enough red blood cells. She is back in chemo and must have transfusions frequently to fite off the over abundance of White blood cells. We want more time with her, but we know it’s not going to happen. Three weeks ago my Hubs got sick. Emergency Surgery. They removed a tumor from his colon. It was malignant. It was not a good day!! It is not easy. We still want another 20/30 years together. With our two wonderful children! So what is the purpose of all this. October 2nd is LiveStrong Day 2010. LiveSTRONG With A Taste of Yellow is an official LivesSTRONG Day event. In honor of the Lance Armstrong Foundation. The Lance Armstrong Foundation unites, inspires and empowers people affected by cancer. 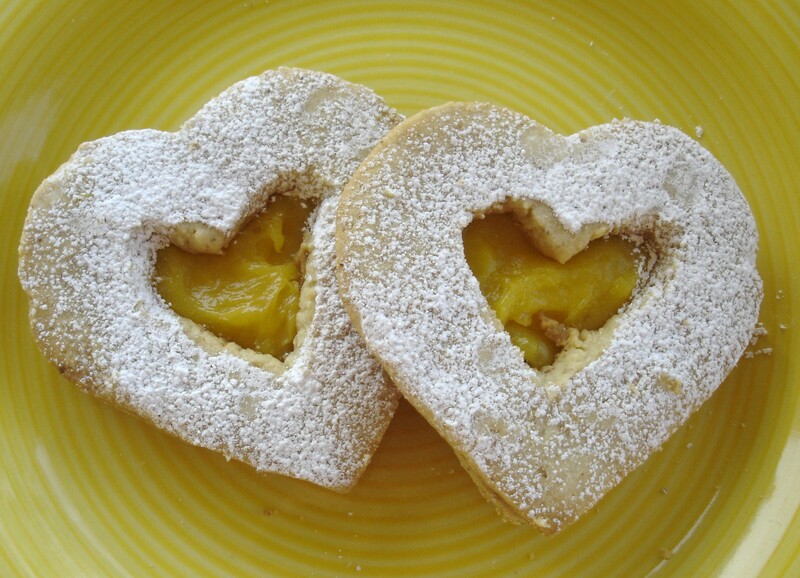 And this year the theme for Live Strong with a Taste of Yellow is Hearts. My heart belongs to my husband. These hearts are for him. The tears I hide from everyone are for all of us. 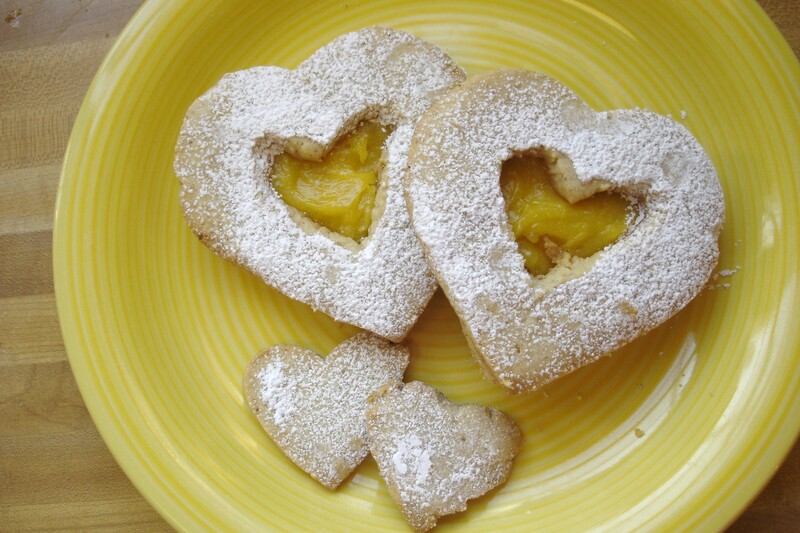 I filled them with Lemon Curd because Lemon Pie is his favorite. Today is October 2, 2010. In case you didn’t know this was the day in 1996 that Lance Armstrong was diagnosed with Cancer. He was 25. Today he is 39. Live Strong!! !